INTRODUCTION: The microbial etiology of inflammatory periodontal diseases provides the rationale for the use of antimicrobial medication in periodontal therapy. Scaling and root planning (SRP) is generally the first treatment employed for periodontitis. 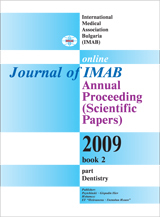 Antibiotics may be prescribed for periodontal patients who do not respond to conventional mechanical therapy, for patients with acute periodontal infections associated with systemic manifestations, for prophylaxis in medically compromised patients, and as an adjunct to surgical and non-surgical periodontal therapy. 1. To determine the value of the microbiological diagnosis with culturing method in the treatment planning of the periodontal diseases. 2. To evaluate the importance of the susceptibility testing for the target antimicrobial treatment of periodontitis. 3. To evaluate the effectiveness of the adjunctive target antimicrobial administration in periodontitis cases. MATERIALS AND METHODS: A total of 17 patients with aggressive or severe chronic periodontitis were included in this study. All patients must have at least 15 teeth and 4 periodontal sites with PD>4mm in different quadrants of the dentition. Microbiological samples were taken from the periodontal pockets using paper points. The samples were taken from tree categories periodontal sites with PD 3-5mm, 5-7mm and >7mm. All samples were analyzed with culture method. Selected colonies from the patients from the test groups were tested for antimicrobial susceptibility. A standardized oral hygiene motivation program was applied to all patients. The Full Mouth Treatment approach was selected for therapy of the patients. Amoxicillin 500mg and Metronidazole 250mg tid for 10 days were administrated on the control group. The patients from the test group received antimicrobial treatment according to the results from the susceptibility analysis. Clinical, radiograph and microbiological evaluations are done again after 3 months. RESULTS: The results from the microbiological analysis are presented in schemes. CONCLUSION: The indiscriminate use of antimicrobials could be influencing the appearance of resistant strains associated with periodontal diseases in the population. That’s why the use of antibiotics must be based on susceptibility testing, instead of a unique protocol of adjunctive antimicrobial regimen. Key words: periodontal disease, microbiological analysis, antimicrobial therapy, antimicrobial susceptibility.